I really had to chuckle when I read the news article from Family Practice News. Headline: “Vitamin D Boost Fluticasone’s Allergic Rhinitis Effect” First sentence reads: “ORLANDO – Daily oral treatment with a vitamin D supplement significantly improved the ability of fluticasone nasal spray to relieve the total, daytime symptoms of seasonal rhinitis in a pilot, placebo-controlled study of 35 patients.” It is hard to describe how many levels of wrong that is made with this statement. It would seem that just pure reasoning would get you to the point that rhinitis and colds are less in the summer than in the winter. Warmth has been shown to not be the issue so really the only thing that is left is vitamin D. Why such a surprise? I guess that I am hedging somewhat here because pollen count that drives allergic rhinitis is higher in the spring and other allergens are higher in the fall. But the thing that is even more wrong is to assume that the vitamin D is improving the performance of a drug when the vitamin D is doing all the ‘heavy lifting’ by itself. The writer then goes on to explain that he would like to get the funding to do a larger study to show what is causing the primary effect. He then explains that he most likely cannot get funding if the effect is just from the vitamin D. He plans to solicit the NIH, but they would have no more interest in improving the health of the nation than pharma. The truth of it is I personally know more than fifty people who have discovered that vitamin D has a significant impact on the symptoms of the common cold. What is even more interesting is that I suspect that total cold remedy sales are significantly down this year because more people are supplementing with vitamin D and spending more time in the sun. This small shift in the total amount of vitamin D in the serum of the population affects the frequency of the common cold as a first result. The question: Is the flu a seasonal disease brought on by lack of exposure to sunshine during the winter or more specifically a reduction in vitamin D? As I have discussed in previous posts, the incidence of the flu has been down this year, although, just in the past week or so there has been an increase of flu complaints. However, the outpatient visits for influenza-like illness is still below baseline which is very unusual for this time of year. I have marked the CDC graph with a red x showing week 8. Last year week 8 was a peak at just below five percent. According to my trend lines, we should be at a peak for this year. The CDC will say it is most likely because of their efforts in getting people to take the vaccine. However, I believe there is a vitamin D component that is creating immunity during the winter months. It has been more than a year or sixty weeks since we were above the baseline of 2.5 percent. Consider the increase in usage of supplemental vitamin D as shown by the survey results from ConsumerLab.com. 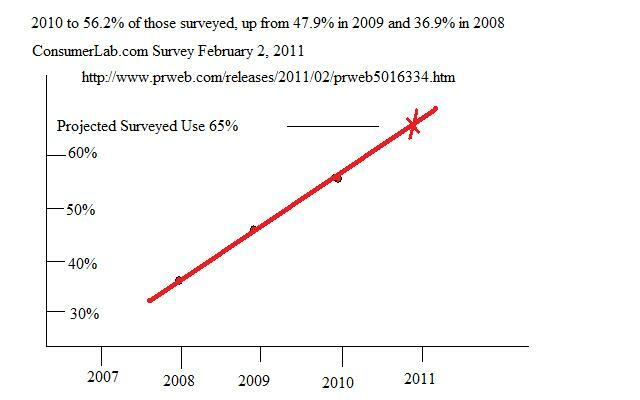 I have marked with a red x the projected usage of supplemental vitamin D for 2011. We should see this curve flatten over the next several years, as increase in use starts to saturate the population. This means that more than sixty percent of the population is now supplementing with vitamin D. I suspect the manufacturers of cold remedies can tell you a lot more about how during the winter of 2011-2012, the use of otc cold medicines was off significantly. With increase use of vitamin D, the drop off of the flu is one of the first things you would expect to see as the serum levels of vitamin D increases in the population. Small amounts of vitamin D have a significant impact on immunity toward viruses. I have reported before in this blog that I had not had a cold since 2004 when I started taking vitamin D. I would like to report that I had my first runny nose since 2004 two weeks ago and it lasted about thirty-six hours. I did increase my intake of vitamin D and vitamin C.
How effective is the vaccine for the flu. We have seen in past years that it is not very effective at all. If you think about vaccines that are effective, you do not have to repeat the vaccine every year. Think about polio and small pox, both viruses. You were vaccinated once and that was it. The vaccine for the flu is encouraged to be taken every year even if the composition of viruses has not been changed in the vaccine. IF vaccines are effective, there is no need to repeat EVERY YEAR. I think the better solution is to make your innate immune system believe that it is summertime all year round. Pain management for the central nervous system, CNS, (also generalized musculoskeletal pain) has implications that are much further reaching than just making you feel better. Of course making you fell better and getting you to relax is really all that most care about when their day is so consumed with excruciating pain. Pain that reaches right through the center line of your body, grabs your heart in its hands, and squeezes until your eye balls pop out. Too descriptive for you, then maybe you should realize there are pain levels beyond what you are currently suffering. When pain becomes too great, your body just starts to shut down in what is commonly known as shock. The action of an upset in the CNS can cause many types of issues as the general signaling for body functions are interrupted. The long term effects of chronic severe pain can cause the brain to shrink. The rate of shrinkage has been estimated for one year of chronic severe pain to be equivalent to fifteen to twenty years of aging. An upset in the CNS can do great harm to you, so the course of action is to slow the immediate pain response and then address the cause. You body’s natural response to slow pain to keep you from doing damage to yourself is shock, which has its own implications. What gives me the right to discuss pain as an expert? I have suffered pain since 1978 or before many of you were born. After realizing that my doctor was just trying to patronize me because he thought that I was a whiner, I begin to research the causes and results of pain. Know that on my pain scale of zero to ten, that the debilitating pain of a ruptured appendix is a four. My spinal cord being seventy-five percent compressed in the lumbar area is now a ten. My research and the use of many different types of pain amelioraters has lead me to come to the conclusion that pain meds can be worse for your body than the pain when used long term. When used short term to stop your body from ‘seizing’ then they are a blessing. Notice that I used the word seizure because that’s what happens when the action potential along the CNS becomes out of control. As an aside, in a discussion with a retired pharmaceutical researcher, he said that the way that they caused rats to seize so that they could test seizure meds was to withhold vitamin D.
I will forgo the long discussion of prescription pain meds and otc pain meds to talk about natural pain nutrients that were designed by nature to affect the way you respond to pain. Know that there are certain things in your body that become deplete that cause the pain response to be worse. When I say pain response, I am talking about not only the initiating pain, but also the ‘electrical disturbance’ that occurs along your nerve pathways after the fact. Imagine a series of electrical circuits that lost their insulation or the controls have failed and exactly the same thing happens in your CNS. Prescription meds either slow the response of release of neurotransmitters at the nerve junction to interrupt communication or cause a different type of neurotransmitter to be released to create euphoria like the endorphin mimics, opioids. A word of caution should be given here about pain meds that are used for reducing the action of voltage gated calcium channels. This includes calcium channel blockers that are used to treat high blood pressure as well as heart disease. The side effects of these drugs can be very damaging and for that reason you should only used these drugs short term until you determine which nutrient deficiency is making you ill. This includes the seizure meds gabalin and pregabalin, that are now being used for pain control. They are nothing more than amino acids that affect the voltage calcium gate. All of these calcium channel blockers are really just mimics of the vital amino acid, l-arginine. L-arginine works by releasing nitric oxide which allows the blood vessels to relax and reduce blood pressure and give you a healthy heart. High blood pressure and heart disease; be sure you are getting enough l-arginine. In a previous post, we discussed action potential or how signals travel along neural cells that compose the nervous system. The last action in the action potential is the opening of the calcium channel to cause the neurotransmitter to be released at the junction of the synapse. The calcium channel is in essence the key to cellular biological functions. I remember reading this in Scientific American in the late seventies and thought the author had lost his mind. He was in fact saying that calcium acts more like a hormone for cellular action than it does a mineral to maintain electrical stability. A natural calcium channel blocker is magnesium. I believe this works by how the energy is supplied to operate the protein that comprises the calcium gate through ATP. So my question to you; why are you taking a calcium channel blocker when most likely all you have is a huge magnesium deficiency. There is no clinical test to determine if your cells are replete in the vital nutrient. It takes six months to a year to become replete with magnesium when your intake is 3.5 to 4.5 milligrams per pound of body weight per day. This is about three times what we find in our normal diet. Magnesium works on the calcium channel of cells that make sure there is enough stored calcium in the cell. http://www.umm.edu/news/releases/calcium_blockers.htm In pain, high blood pressure, or heart disease, take adequate amounts of magnesium per day. As you need energy, there is a need to be sure the ‘engines’ that generate energy requirements of the cells are healthy. Mitochondrial bodies are these engines that carry on the ATP/ADP cycle for energy transfer. This is the energy that operates all of the ion gates in cells and along neural cell axons for the sodium/potassium gates. Magnesium and vitamin D3 are the things that keep the mitochondrial functions adequate. There is also the need for elimination of waste as in any process there is intake/action/product and waste removal. Sulfur is the body’s natural compound for removing waste. Organic compounds that need to be removed from cells forms an ester with sulfur. This is water soluble so the waste moves out of the cell and out of your body. In pain, itching, low energy, and have general malaise, then be sure you are getting an adequate amount of vitamin D3, magnesium, potassium, and sulfur. I will relate this story by my daughter a pharmacist at a local university hospital. She had a patient that required so much pain medicine to control the pain that the patient was not lucid. After giving the patient significant amounts of vitamin D, she was able to reduce the patient’s pain meds to less than half. The patient was then able to function normally. Here is a great review of vitamin D3 and pain for the clinician. Vitamin D for Pain http://pain-topics.org/clinical_concepts/vitamind.php CAUTION USE D3 ONLY! NO D2!